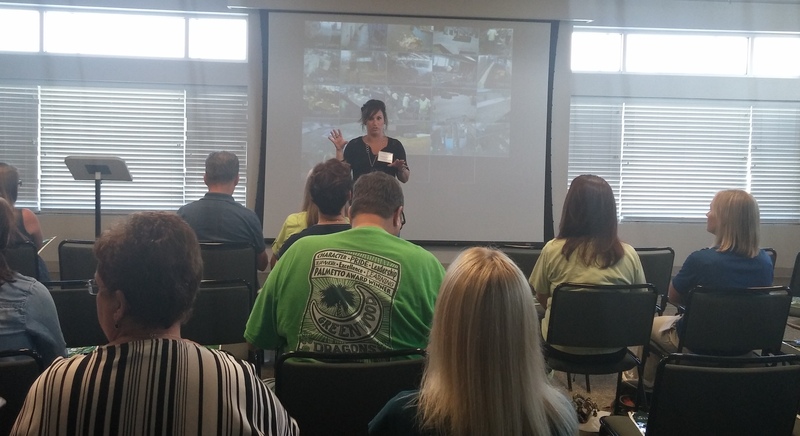 Workshop Offers Award-Winning Environmental Curriculum for S.C. Teachers | Live Healthy S.C.
Nearly 50 teachers and environmental educators were trained in Conway this week as part of the Action for a Cleaner Tomorrow program. This free training was provided by DHEC’s Office of Solid Waste Reduction and Recycling. The curriculum is correlated to the state’s science standards. The current edition features 16 lessons, including topics such as recycling, waste reduction, composting, buying recycled, and air quality and water conservation. Each lesson provides a learning objective, background information and teacher preparation materials. Teachers at this week’s training also had the opportunity to tour the Horry County landfill and the county’s materials recovery facility. DHEC has recently changed its training model to offer multiple smaller workshops around the state so that teachers don’t have to travel long distances to attend a single workshop in Columbia. This was the second workshop of the summer, and nearly 140 teachers have been trained. South Carolina is one of the few states in the nation that offers a program of this type. Please visit DHEC’s website for more information. This entry was posted in Environment and tagged Environment, teachers, training on July 31, 2015 by SC DHEC.